What a blast to get to eat at Simone Padoan’s cutting-edge pizzeria I Tigli in San Bonifacio in Soave township last night! 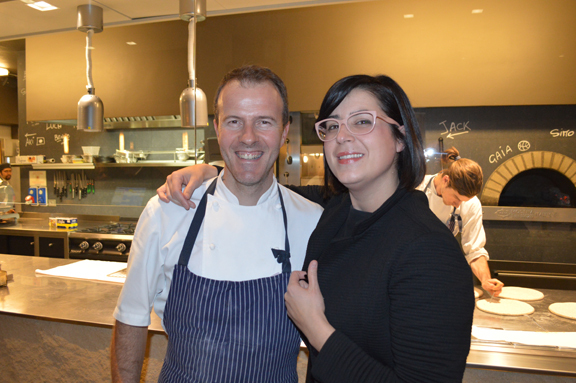 That’s Simone (above, left) with Lisa Anselmi, who treated us to a wonderful dinner at this fantastic restaurant. 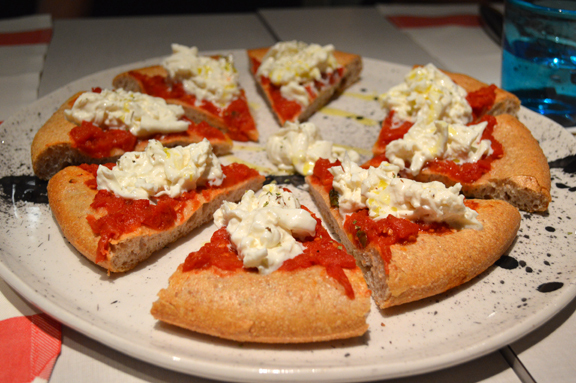 Simone is a mother yeast master and he uses different mothers to create a wide variety of flatbreads inspired by the various regions of Italy. The doughs are baked (and sometimes steamed) first and then the toppings are added. That’s burrata and tomato, above. 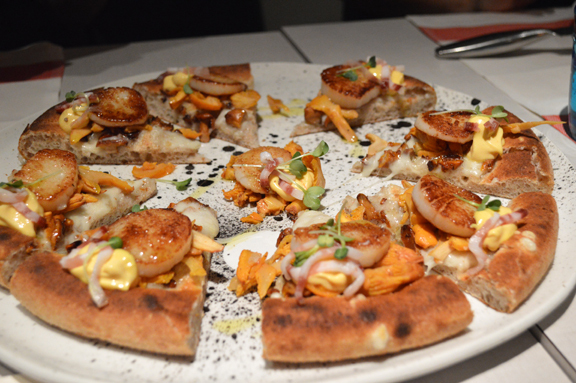 Scallops and chanterelles. This was my favorite but they were all over-the-top good. 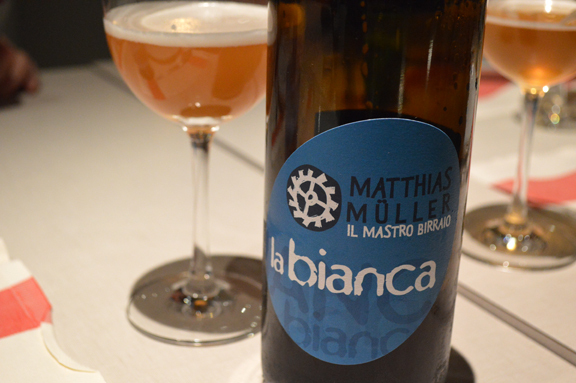 I Tigli is also an epicenter for the artisanal and natural beer movement in Italy, with a thick list of super groovy labels. This was our table’s favorite label of the night. 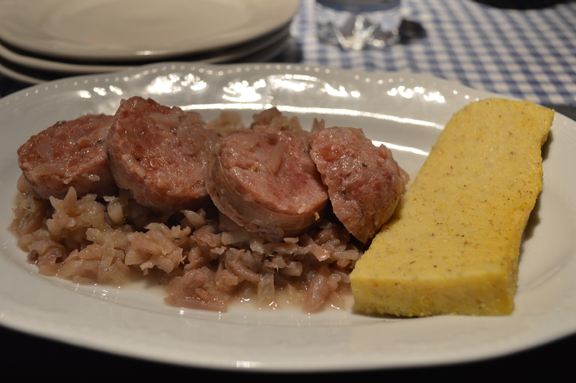 Musetto (boiled pig snout sausage) and brovada (shredded sour turnips macerated in red wine) at Osteria al Cappello. 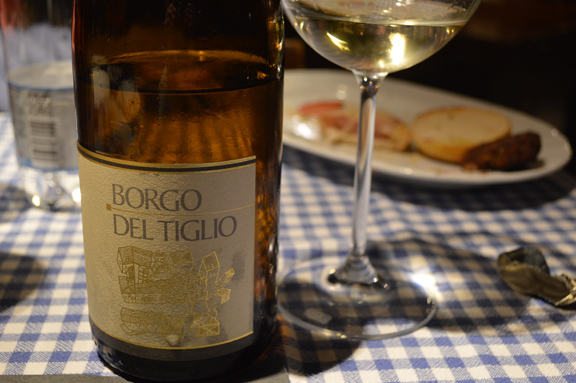 Borgo del Tiglio white blend. Even an older vintage of the winery’s entry-tier white blend always delivers. Great winery, great wines. 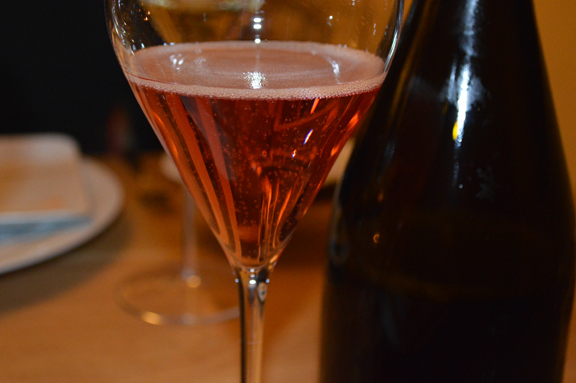 The 2010 Barone Pizzini Franciacorta Rosato sang in the glass last night. 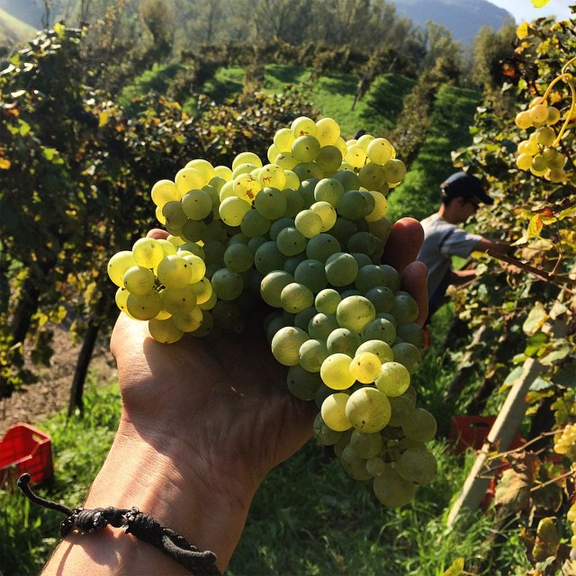 This wine is going to be a big hit for my friend and client Silvano Brescianini, the winery’s GM. 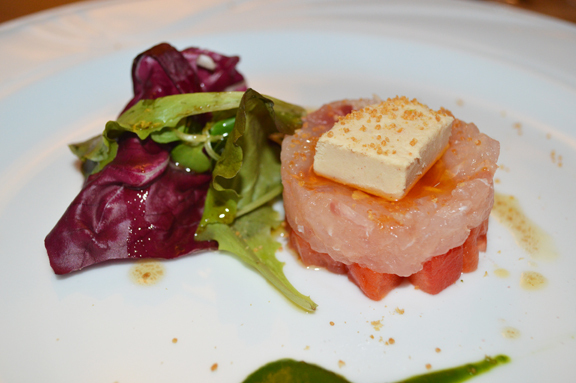 Thank you again, Chef Vittorio and Silvano, for an unforgettable evening. 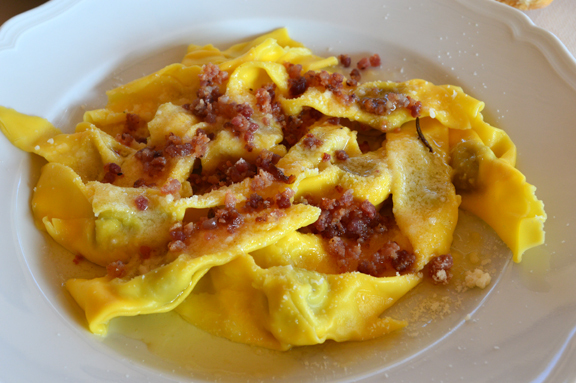 Super fun lunch yesterday at the very old-school Osteria della Villetta in Palazzolo sull’Oglio, which lies on the very western edge of Franciacorta. 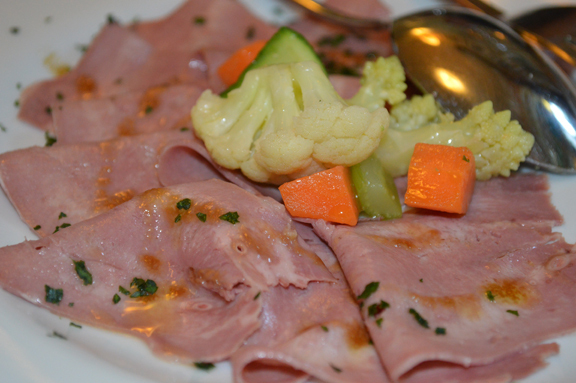 That’s the thinly sliced and delicately dressed tongue, above. 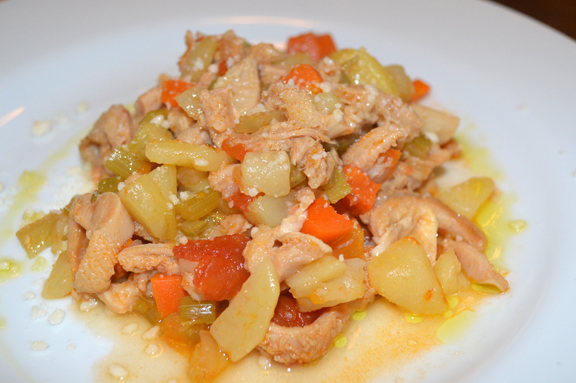 The tripe was tender and rich with flavor. I didn’t get a good photo of the cabbage stuffed with finely ground pork but it was another highlight. 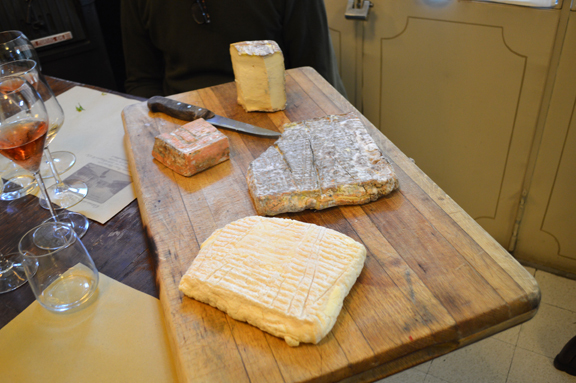 The aged stracchino (with the dark rind in the middle) was off-the-charts good. 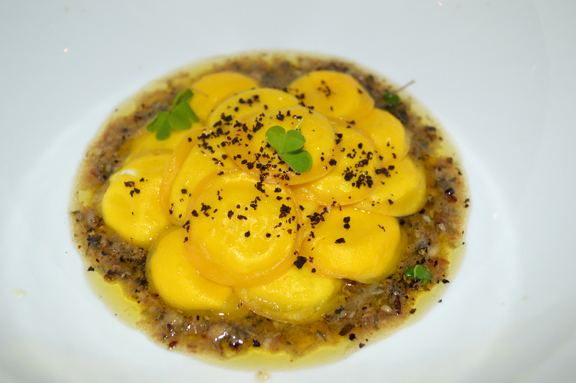 Really blown away by Riccardo Camanini’s cooking last night at Lido 84 on Lake Garda just outside Salò. Those are cheese-stuffed pasta “buttons” (above) swimming in eel garum (the fermented fish sauce adored by the ancient Romans). 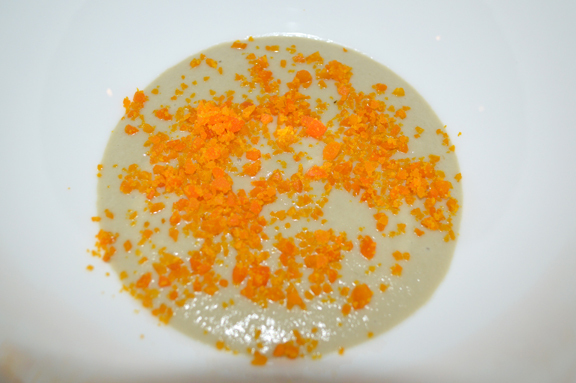 Warm cardoon purée with shaved salt-cured anchovy. 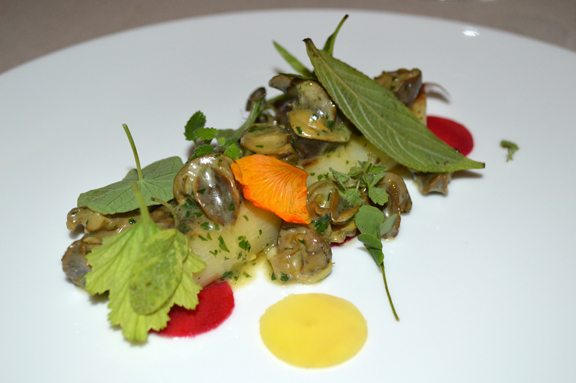 Giant leek (I believe cooked sous-vide) with snails. 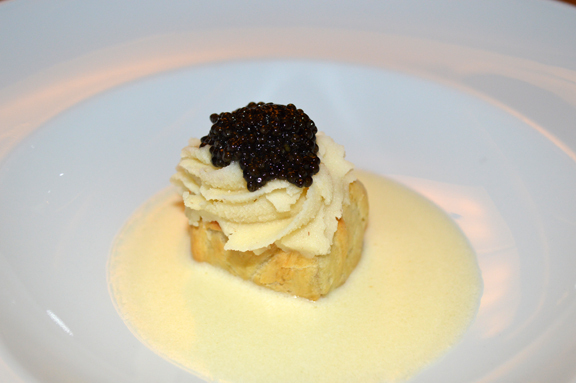 One of my top dishes of the year. 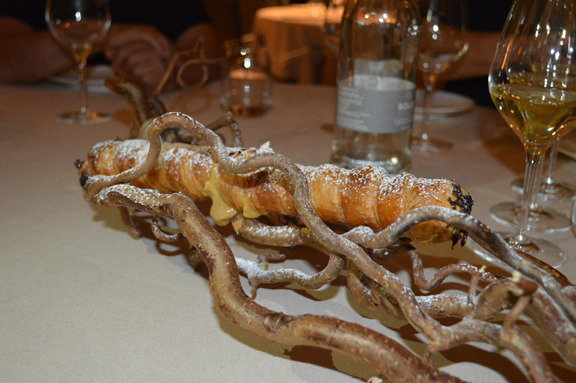 Loved the presentation of this giant cannolo. Riccardo’s cooking is brilliant. And his staff world-class. 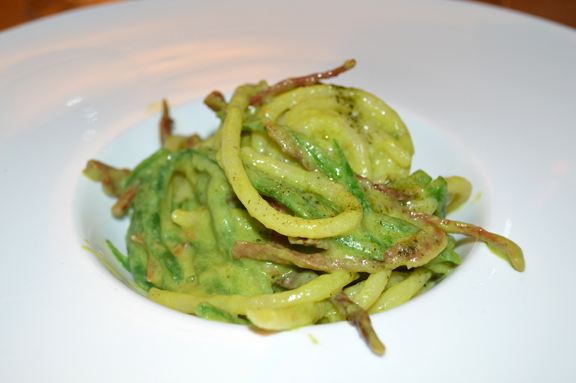 Casoncelli stuffed with prosciutto and herbs. 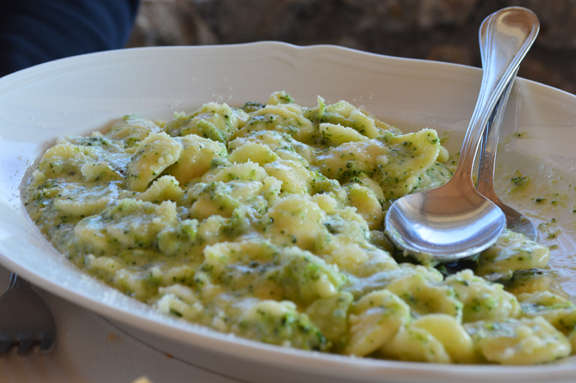 Orecchiette with broccoli florets and Bagòss, a local crumbly cheese, a “north-south” fusion dish. 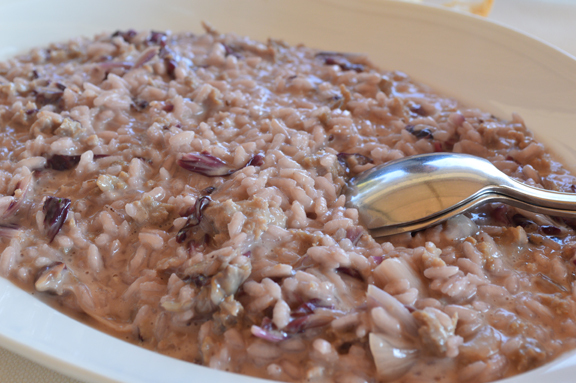 Risotto with radicchio and sausage. The cinnamon in the sausage really took this dish over the top. 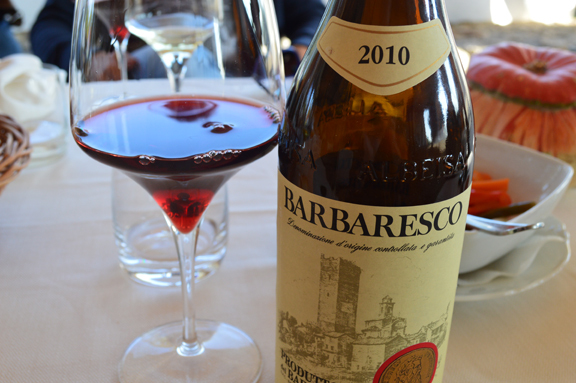 Always a thrill for me to settle in with a new vintage of Produttori del Barbaresco. It was my second chance to taste this wine. I think it’s going to be a great one for the winery. 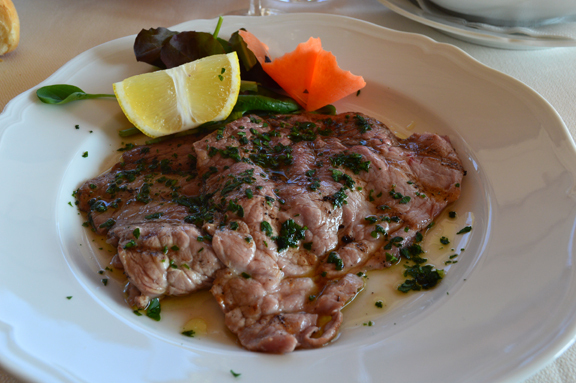 Horse steak dressed with olive oil, flatleaf parsley, and lemon. 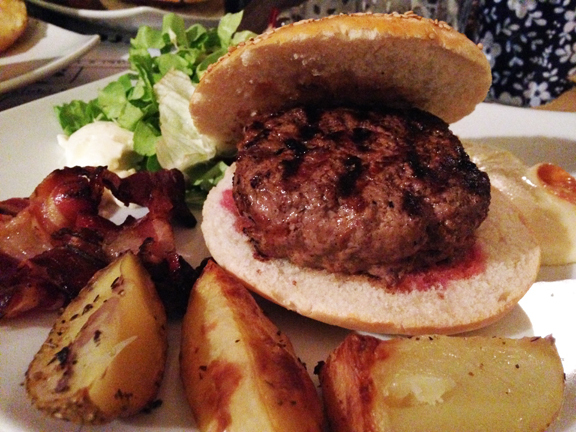 Just had to have a burger and beer at Bar Torre d’Ercole in Brescia on Saturday night. Here’s the thing: they’re now making there burgers with dry-aged Chianina and roughly 10 percent ground uncured pork belly in the mix. Definitely one of the best burgers I’ve ever had. Italians are hamburger-crazy these days and I wasn’t surprised when I was wowed, once again, by the burger at Torre d’Ercole. 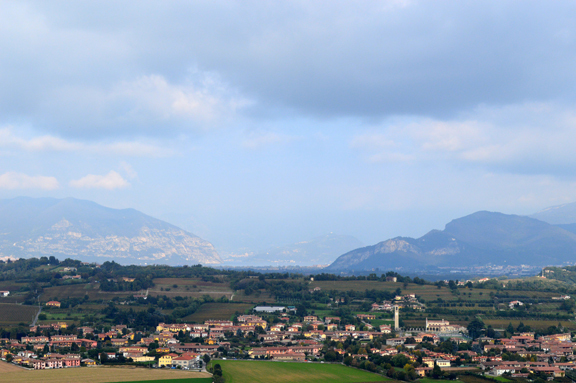 Brescia province has always been an epicenter for beef, I’ve learned. As fate would have it, my friends, the Brothers Pontiak, were playing Brescia that night and so we caught their super-packed show. 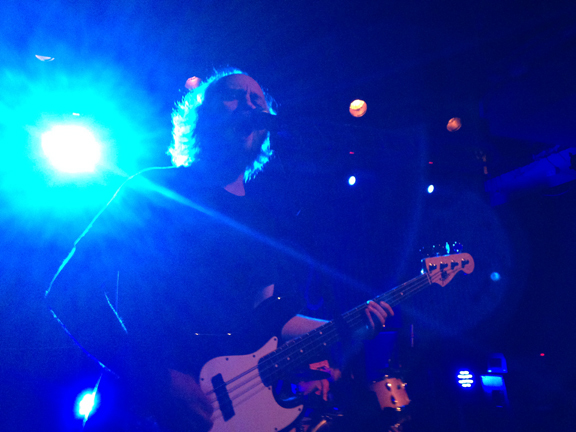 I don’t know how they do it but they tour with Steve Albini’s backline while in Europe. How cool is that? They have a huge following in Italy and the show was awesome. 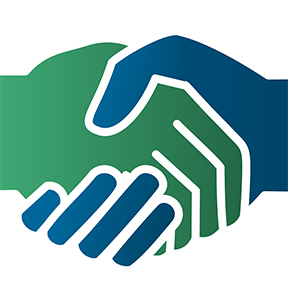 Posting on the fly this morning on my way to mxp: check out my client Luca Ferraro’s response to a col fondo detractor, including my translation of the comment that sparked the debate. 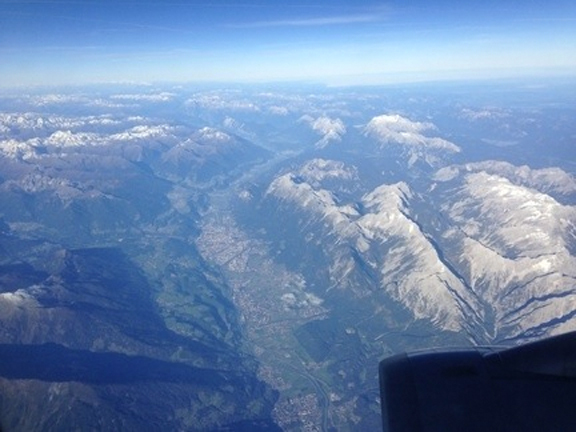 Above: Innsbruck, Tryol (Austria) as seen from the air. When I was in my twenties, the view would have thrilled me. Today, it makes me pine for my family. The unbridled curiosity of youth took me to Europe in my twenties when I spent a decade alternating school years between Los Angeles, Padua, Pisa, and Rome. There was always a scholarship or fellowship (including the Fulbright) that delivered me across the Atlantic and there was always a summer gig in Proseccoland that fed me when the grant money ran out. A decade in New York followed and so did the yearly trips to the old world. Those were years, too, when I regularly hit the road with rock bands. Back then, I’d drive to Cleveland or even Detroit from the east coast in a straight shot with a van-load of drums and guitar amps. Today, the thought of departing for Europe fills me with unease.